Daughter and only child of Mourad Saber Shabaq al-Rayes and Rafqa Gemayel. Her mother died when Rafka was six. She and her step-mother never got along. The girl worked as a maid from age 11 to 15, announcing at age 14 that she felt a call to religious life. Her father objected, but at 21 she became a nun in the Marian Order of the Immaculate Conception at Bikfaya, taking the religious name Anissa (= Agnes), and making her final vows in 1856. In 1871, her Order merged with the order of the Sacred Heart of Jesus. The sisters were given the choice of joining the new combined order, joining other orders, or being released from their vows. Following dreams in which Saint Anthony the Great appeared to her, she joined the Lebanese Order of Saint Anthony of the Maronites (Baladiya Order) on 12 July 1871, a novice at age 39, taking the new religious name of Rafqa (= Rebecca). On the feast of the Holy Rosary in 1885, Rafqa prayed that she might share Christ's sufferings. Her health began to deteriorate, and she was soon blind and crippled. She spent as much of her remaining 30 years in prayer as she could, but always insisted on working in the convent as well as she could with her disabilities, usually spinning wool and knitting. By 1907 she was completely blind and paralyzed. In a 1981 medical report based upon the evidence presented in the Canonization process, specialists in ophthalmology, neurology and orthopedics diagnosed the most likely cause as tuberculosis with ocular localization and multiple bony excrescences. This causes unbearable pain, but Rafqa was thankful for her special form of communion. 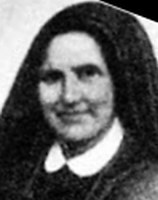 Late in life her close friend and supporter, Mother Superior Ursula Doumit, ordered her to dictate her autobiography, and Rafka complied. Near the time of her death, Rafqa asked that her sight be restored for a single hour so she could again see the face of Mother Ursula; the hour of sight was granted. Beginning four days after her death, miraculous cures were recorded at Rafka's grave, the first being Mother Doumit whose throat was slowly closing so there was fear she would starve to death. 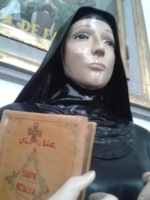 Elizabeth En-Nakhel from Tourza, northern Lebanon, was cured from uterine cancer, through Rafqa, in 1938, the miracle which permitted her beatification. Well educated in general, and a professor of philosophy and rhetoric. Joined the Benedictines at Rebais-en-Brie to escape the world and the temptations presented by success in his field. Against his will he was made abbot of Pontoise Abbey by King Philip I; Walter reminded the king that it was by God's will that he did such a thing, not the crown's. He fled the house several time to escape the position, the last time to Rome, Italy where he gave Pope Gregory VII his written resignation; the pope told him to return to his house, assume his responsibilities as abbot, and never leave again. He obeyed. Worked against simony, lax discipline, and dissolute lives of some of his clergy. He was opposed by the corrupt and the corrupters that he fought, and they finally resorted to imprisoning and beating him. On his release, he resumed his work, often spending the whole night in chapel, praying for strength and wisdom. Born to the Italian nobility, Pietro studied law at universities in Perugia, Italy, and Paris, France. He was a successful and brilliant lawyer known for his honesty, and who concentrated on representing the poor. When he was 40 years old, Pietro came to know the Augustinians and was drawn to them, wanting to put himself and his law practice at the disposal of the Church. Priest. Friar in the Augustinian monastery in Gubbio, Italy. Chosen by the Order‘s vicar-general to serve as Provincial Visitor to Augustinian houses in France; tradition says that he travelled bare-footed and met all his brother Augustinians that way as a sign of humility. Noted preacher. Known for his holiness of life, his zeal for the Augustinian Rule and the Christian life, his patience with Augustinian brothers who had trouble living up to the Rule, and as a miracle worker. He spent later years as a prayerful monk the Gubbio monastery where he had begun. Born to the Italian nobility, he became a knight and fought in defense in the pope in the area of Frascati, Italy. Captured on the field, he was imprisoned in a tower until he prayed for the intercession Saint Leonard of Noblac and received miraculous assistance in escape. Pilgrim to the Benedictine abbey to Saints Trinity of Cava dei Tirreni; he did not become a monk, but lived there, spending his days in prayer and work. From there he moved to the monastery of Montevergine and became a spiritual student of Saint William of Vercelli. Moved to Ariano Irpino, Italy in 1117, and devoted himself to care for the pilgrims that came through the city en route to the Holy Lands. He began living nearby as a hermit in 1120; Ottone even dug a grave next to his cell as a reminder that death was always near. His reputation for holiness, wisdom and miracles soon spread and drew many would-be students. Born poor. Studied at the University of Barcelona. Awarded a doctorate of theology on 1 August 1674. Ordained 30 May 1676. Pilgrim to Rome, Italy in 1686. 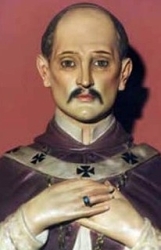 Pope Innocent XI granted him a benefice at Santa Maria del Pino (Our Lady of the Pines), Barcelona, Spain, a parish he served for the rest of his life. Wanted to evangelize infidels, and give himself over to martyrdom. On his way to Rome in April 1698 to ask to be a missionary, Joseph fell ill at Marseilles, France, and had a vision that gave him a new mission - revitalize the faith in his own back yard. Returning home, he worked with the youngest of children and roughest of soldiers, and prayed without ceasing for the living and the dead. He wore a hair-shirt; lived for 26 years, half his life, solely on bread and water. Famed confessor, prophet, healer, and miracle worker, though many of the writers in his day and after have made him sound like some kind of medium or magician or somesuch. Redemptorist, making his profession on 25 August 1904. Priest, ordained in Prague (in modern Czech Republic) on 17 July 1910. Worked in parish missions. Vice-provincial of his order on 23 March 1946. On 14 April 1950 the Communist government of Czechoslovakia outlawed religious communities. On 21 April 1952 Father Metodio received a show trial and was sentenced to 12 years imprisonment for his work; he was repeatedly tortured by interrogators. Locked in an isolation cell as punishment for singing a Christmas hymn, he contracted pneumonia. Martyr. One of eight children. Joined Opus Dei in 1935. Engineering student. Member of the Saint Vicent de Paul Society, and taught catechism to children in in poor neighbourhoods where the Society worked. Priest, ordained on 25 June 1944 in Madrid, Spain. Assigned to work in Rome, Italy in 1946. Bishop of the Personal Prelature of the Holy Cross and Opus Dei on 28 November 1982. Titular bishop of Vita on 7 December 1990. Born to the nobility. Lawyer. Professor of law at Salamanca, Spain. Ordained in 1578 at age 40. Judge of the Court of the Inquisition at Granada, Spain. Archbishop of Lima, Peru on 15 May 1579. Founded the first seminary in the Western hemisphere. Fought for the rights of the natives against the Spanish masters. Organized councils and synods in the New World. The wealthiest subject of the Vandal king Hunseric, Victorian served as governor of Carthage with the imperial Roman title of Proconsul, and was known for his devotion to orthodox Christianity. Hunseric offered him all the wealth and power he could bestow if Victorian would declare himself a supporter of Arianism; Victorian declined. He was arrested, tortured and killed for his refusal. Son of the pagan King Clito of Ireland. When Saint Patrick arrived at Clito's court, the king was hostile; Gwinear recognized Patrick‘s sincerity and piety, treated him well, and meditated on his message. Convert to Christianity. Hermit. Upon his father‘s death, he returned home, gathered 770 other converts, and worked to spread the faith in Wales and Brittany. Miracle worker. Martyr. The Cornish village of Gwinear is named for him. At Pluvigner there is a stained glass window of Gwinear hunting a stag with a cross between its antlers, and there is a holy well with his name near the church. A group of five Christians who protested public games which were dedicated to pagan gods. Martyred in the persecutions Julian the Apostate. The only details we know about them are their names - Aquila, Domitius, Eparchius, Pelagia and Theodosia. Joined the Dominicans in 1622. Priest. Prior of the Dominican house at Naas. He was ordered to acknowledge the English king as head of the Church; he declined. Martyr. Orphaned at age seven. At 17 she opened a school for poor girls in her home. Taught school at Rovato, Italy at 22, and then at Cemmo Valcamonica, Italy. Helped found the Sisters of Saint Dorothy of Cemmo, and served in the order for 40 years. Priest. Benedictine monk at the monastery of Ripon, England. Hermit on the island of Inner Farne, England in 687. A miracle worker, his prayers were known to stop storms that threatened visitors to his island. Benedictine hermit in the Campagna region of Italy. 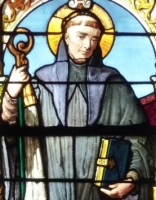 Friend of Saint Benedict of Nursia. Captured by Totila the Goth, he was thrown in a fire to die; he stayed in the flames until the next day when he miraculously emerged unharmed. Distinguished Roman soldier. Converted to Christianity while travelling in Palestine. Spiritual student of Theodosius of Cyzicus. Leader of 200 Christian disciples who fled to Sicily to escape persecutions of Decius in Palestine. They could not escape it, however, and all were martyred. Martyred with his wife and children in the persecutions of the Arians; only the father‘s name has come down to us. Wealthy merchant. Martyred in the persecutions of the Arian Vandal King Hunneric. Fifth century abbot at the monastery at Fiddown in Kilkenny, Ireland. Fifth century martyr, killed in the Vandal persecutions with 20 other Christians whose names have not come down to us. Benedictine monk at Monte Cassino. Priest. Martyred in the persecutions of the Arians. Mentioned in early calendars and martyrologies, but no information about them has survived.